Flowering time: Late April-June. Perennial. Native. 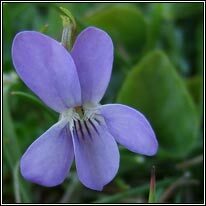 Bluish-mauve or whitish flowers with blunt yellowish / greenish spur. 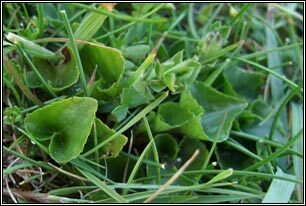 Leaves longer than broad, cordate (heart-shaped) at base. No basal leaf rosette. Creeping stems. Sepal appendages not enlarged in fruit. More/less hairless. Local on acidic ground. 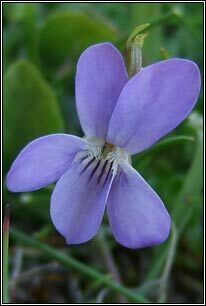 Heaths, coastal dunes, acidic grassland, fens. Most frequent in W and NW Ireland. Declining due to habitat loss. 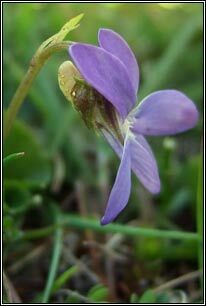 Hybridises with Common Dog-violet and Pale Dog-violet.